Le Labo is a relatively new niche perfumery in New York City. Last week I posted some background on Le Labo along with a list of their fragrances, and today I am wearing one of the offerings for men, Rose 31, by perfumer Daphne Bugey. The fragrance notes are Grasse rose, cumin, pepper, clove, nutmeg, olibanum, cedar, amber, gaïac wood, oudh wood, cistus, vetiver and animalic notes. 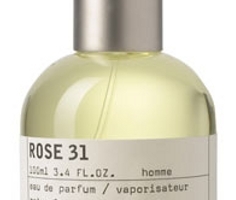 Rose 31 is one of my early favorites of the Le Labo line. The list of notes include cumin, so I was fully prepared to hate it (and for that matter, I was prepared to remove it quickly if necessary); instead, I was charmed. It starts with light citrus and strong, dusty spices, and for anyone who is as cumin-phobic as I am, I will say that the cumin is quite noticeable, but the effect is buffered by the other spices — I guessed coriander and maybe cardamom, but as you can see from the notes above I was quite off — and it did not, as cumin often does, remind me of sweat. The rose itself is subdued, and I tend to notice it more from a distance, especially after the fragrance dries down. Up close, Rose 31 is all deep, dry woods with earthy undertones and soft spices. It has a slight medicinal edge in the early stages, perhaps from the oudh, but that calms nicely. It is a dark scent, more warm than cool, but it is not particularly heavy, and I find it only mildly animalic. It is not too masculine for a woman to wear, but there is nothing at all feminine about it, and certainly it is more likely to appeal to someone who likes spicy woods scents than someone who is looking for a rose soliflore. Like the other Le Labo fragrances, Rose 31 is an Eau de Parfum, and the lasting power is excellent. The line is priced for the niche market: a travel spray (15 ml) runs $45, a 50 ml bottle is $115. Sizes of up to one liter are available, as are solid fragrances, body lotions, bath oils and home fragrances. I am interested in the rose even if it's not a soliflore.I'm surprised at how muched I really loved the Jasmine which smelled so fresh and lovely.I can't wait to sample the others. Wxcellent review. How would you say it compares with Czech and Speake's Dark Rose, that one is also woody with an oudh note. Looking forward with anticipation for the website. The Jasmine is very pretty, although have only tried it once so far and it wasn't really a case of instant love. Hope to try it again this week. Ooooh, cumin, yum! Rose and cumin- double yum . I cannot wait to try this. M, this might turn out to be one of the rare things we both like. It’s a perfume that I am not done with, I tried it today again and really like it, specially the citrus & animalic notes, I still cannot figure out how masculine it is, but I would ware it, but also .. perhaps not.. … It’s months that I have this attidute with Rose 31. So strange that a perfume can do that, that you cannot clear up your mind about it…..
Yes…and if a perfume demands that much attention from me, it usually means I’ll end up buying it! just sampling this for the first time today – Oh dear lord I’m in love! Thank the heavens Monica is currently doing a spit of this – I can get 10 mls for not too much – phew!!! !